Raise your hand if you've ever watched Galtar and the Golden Lance. I'd never heard of it before researching Old School Evil and I feel like I really missed out on it. This cartoon is seriously one of the better ones I've recently discovered. Other shows that I watched in the last few weeks (like Robo Force, Mighty Orbots, and Sectaurs) which only lasted a few episodes and only got what they deserved. Galtar, on the other hand, only lasting 21 episodes, feels like it should have gotten a lot more. After Galtar's village was attacked by the warlord Tormack, and his army of Mongol-like Gurkas, he quests to find the Golden Lance, a powerful weapon that only works for those pure of heart. Tormack is after the same weapon so he can unite it with the stolen Sacred Shield, which will make him invincible. The story follows Galtar and Goleeta, princess and rightful owner of the shield, and they evade Tormack's attempts to steal the lance for himself. Tormack has a history with the Golden Lance; having an evil heart cause the weapon to unleash the Fury of the Golden LAnce, which blinded one of his eyes. Tormack employees the wizardry of Krimm, who uses the shield's connection to Goleeta, and his horseman Otar leads his forces into battle if he isn't involved. 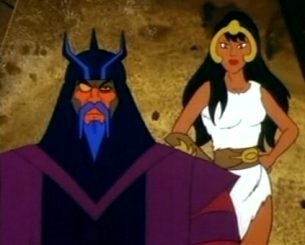 Tormack's an impressive villain, given live by the incredible baritone of Brock Peters, who went on to give voice to another Hanna Barbera villain, Bloth from Pirates of Dark Water. Actually, this cartoon shares a lot with fellow Hanna Barbera cartoons, like Pirates and Thundarr the Barbarian. Both have a hero who recruits a team of two others, one being a sort of telepath, another being a female (though there one in the same in Pirates). A lot of the designs in Galtar are present in it's predecessor; Thundarr's and Galtar's mount look almost the same, along with their weapons, even if Galtar's comes in a pair. 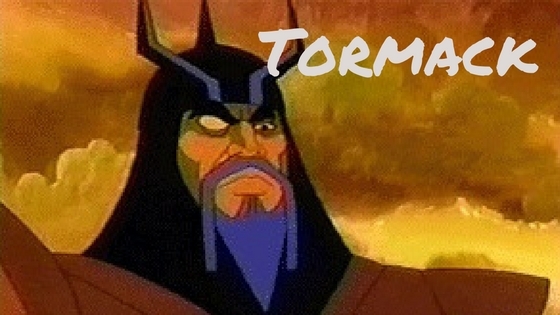 Thundarr doesn't have his own signature villain, but Tormack and Both share more than just their voice, as both lead huge armies that have taken over significant portions of land. Heck, their even both responsible for the main character's parents being killed. Another thing this cartoon shares with Pirates at least is that I actually really enjoy it and want to watch more. There are a lot of shows I've seen for Old School Evil that feel like a chore (looking at you Sectaurs), but Galtar is more than that. I only got to watch the first 5 episodes so far, but I've read about the following ones. Goleeta's brother has just joined the team, and the next episode to watch introduces Rava to the mix, who is revealed to be Tormack's niece. Apparently a love triangle forms between Galtar and Goleeta and Rava, which is pretty different for most cartoons at the time, along with Tormack's leniency to his niece, since she plays both for and against him at times. There are a lot of relationships built between the characters and I'm actually interested in seeing how they develop. Coolness - 7. I've got to give Tormack credit, he's a freaking awesome villain. It's more than just the great voice Brock Peters gave him though. He's one of the very first regular villains in a Hanna Barbera cartoon. Most of the ones that came before him, like in Thundarr, made a single appearance then were never seen again. They'd make up a wizard, maybe one that looked just like Krimm, give him a goofy name, maybe one that sounded just like Krimm, and that would be that. Tormack bucks the trend and gets to be a really cool, threatening villain because of it. Effectiveness - 5. Tormack's got a great presence, tall and foreboding, but still capable in a fight. He treats his minions with respect while not being taken advantage of (especially by the backstabbing father-and-son duo, Ruk and Tok). He owns one of the most powerful weapons in the world and uses it in battle against it's rightful owner, like he's rubbing it in Goleeta's face. He's already killed off the parents of all the main characters, not just Galtar's. He gets the job done! It's a shame the cartoon ended without a final confrontation between the two.